With the bounce of a cheetah, I jumped out of bed and was out the door. Much to my despair, the rest of my family was not behind me. With my heart pounding, I banged on the hotel room door as the fire alarm seemingly blared louder and louder in the background. Knowing that safety was still six floors away, I wanted all of us to start our descent as quickly as possible. Nothing scared my little soul more than the possibility of dying in a fire. The very idea of feeling my skin being cooked by a red, hot flame and of my throat being stuffed with scratchy smoke chilled me to the bone. The only thing scarier to me than expiring in a burning hotel was the thought of spending an eternity in the flames of hell. Although it turned out to be a false alarm, experiences like this always caused me pray a little more fervently for salvation. Starting on this Friday, the Left Behind movie starring Nicholas Cage will inspire kids all across America to pray a little harder. The fear of losing a parent, of crashing into car, or of being the victim of senseless violence will resonate with many a small heart. And our kids should be scared of God’s wrath and of separation from his love and mercy. But, one of the downsides of Hollywood dramatizing God’s judgment is that little minds tend to forget God’s mercy even when it is given screen time. 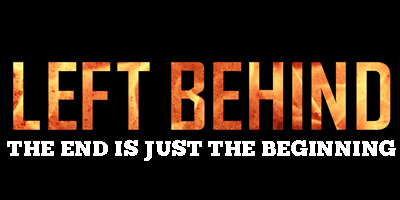 Left Behind will undoubtedly be spawn more nightmares than peaceful dreams of heaven. As parents, we always need to ready to balance the stories of God’s anger with the comforting hope of salvation. As a child, I was truly afraid of judgment and ran around with a good deal of childhood angst. At times, I would ask God to save me for weeks on end. But nothing changed. I was still the snotty, little kid who loved himself to the point of annoying his older brother and disobeying his parents. I did not want to spend eternity in hell. But, I also was not all that excited about the possibility of spending an eternity with bunch old people singing out of my church’s hymnals. Fear did not lead me to love Jesus. I just realized heaven was the better (no eternal fire) of the two rather sullen options and was trying to get there. What eventually brought me to Christ was the beauty of our savior. At the age of 14, I realized that by dying to my selfish desires, I would finally live. I no longer wanted a “get out-of-jail-free card.” I was no longer scared that the things of the world were passing away. Let them pass. I wanted Christ (I John 2:15-15). I loved Jesus and happily submitted to him. Bad news is the backdrop against which the good news really shines – (Chandler & Snetzer, p. 12). To preach Christ effectively to our kids, we must help them understand that they are sinners in need of savior. To some degree, I’m sure Left Behind will help us hammer home the truth of judgment with pervading force of the big screen. But, we must remember that this picture is only the beginning of the story. We should help our kids shift their graze from movie screen violence to the glories of heaven. We need to remind them of God’s grace and goodness. By his stripes we can be healed (I Peter 2:24). By his work on the cross, we can escape hell. But salvation is so much more than escape from punishment. It’s happiness, joy, hope, and the ability to be good, kind, and loving. It’s being with the God of the universe! Regardless of whether or not you allow your children see Left Behind this weekend, decide today to consistently show your kids both the ugliness of their sin and beauty of God’s mercy! Chandler, M., & Snetzer, M. (2014). Recovering Redemption . Nashville: B&H Publishing .